Guitar Pickups - Your Ultimate Guide from Andertons Music Co. They are the reason that your guitar sings the way that it does...but how much do you really know about your pickups? In our Ultimate Guide, we'll look at why pickups make such a difference to your tone, and explore how you can find the perfect set for you! Have you ever noticed that if you pluck the string close to the bridge the note will sound bright and twangy, whereas if you pick right down by the neck you’ll hear a softer, rounder tone? Similarly, if you place a pickup near the bridge of the guitar it will sound sharper and brighter compared to one that’s placed near the neck. This is why the majority of guitars have more than one pickup: so you can select different sounds from the full and warm to the thin and snappy. The simplest way to think of a pickup is as if were a microphone for an electric guitar. A guitar pickup is a magnet that senses the vibrations of your strings, then converts them into an electrical signal that can be amplified, thus making noise! A pickup's magnet is usually made with a core material such as alnico or ferrite, then wrapped with coils of copper wire, but if you start changing these properties, i.e. the core material or the number of coils, you can attain different sounds! There are two main types of pickups: single coils and humbuckers. Let’s have a look at each, and what they do, and then go into a little more detail. How they work: Insulated wire is wrapped around six individual magnets. When the steel guitar string is plucked, the magnetic field is disturbed, and this change is captured by the wire and sent to the amplifier. How they sound: Clear and detailed: snappy, twangy, bell-like, jangly. How they work: A humbucker is made up of two coils instead of one, each with their magnets going in different directions (one with north ‘up’ and the other with north ‘down’). When connected together, the characteristic single coil hum is cancelled. How they sound: Full, thick, ‘hot,’ loud, smooth. Why Would I Want Single Coils? Single coils (like you might find on a Fender Telecaster or Stratocaster) have a clear, twangy sound, and they tend to sound really great through a clean, un-distorted amp setting. This type of single coil pickup is made by wrapping wire around six ‘slug’ pole pieces (which are held in place by flatwork to create a bobbin). A cover is usually placed over the pickup to protect the wire. But single coils have a drawback: you’ll notice a bit of background buzz which is just part and parcel of the single coil experience. Some players swear by this excess noise, as it evokes a vintage sound. Others want to get rid of it, and simply enjoy the pristine single coil sound minus the hum. Various noiseless single coils are available from companies like Fender, DiMarzio, Kinman and Seymour Duncan. Single coils are great for country, blues, indie and alternative styles. Why Would I Want Humbuckers? The idea behind humbuckers is to use two separate pickup coils, each wound in a different direction, over a central magnet. The hum is cancelled out by the two different coil directions (hence the name 'hum-bucker'), and the overall tone is generally thicker, louder, warmer and fuller than single coils. Humbuckers are great for heavier styles like classic rock, hard rock and metal, and they can add some toughness and raunch to blues too. And the softer, smoother tone of humbuckers makes them great for jazz as well, especially if you use a humbucker in the neck position on a big hollow-body guitar. In some cases, you'll see single coils and humbuckers in the same guitar. Popular configurations include a humbucker in the bridge position with single coils in the middle and neck spots, humbuckers in the bridge and neck with a single in the middle, or a single coil in the bridge position of a Telecaster with a humbucker in the neck position. The P90 is a single coil too, but it’s larger than a Stratocaster-style single coil, and its sound is edgier, rattier and hotter. It’s a great choice for alternative, punk, country and blues, goes great with slide guitar, and is even suited to styles like stoner rock and vintage metal: flip to the neck pickup of a P90-loaded guitar and play Black Sabbath’s “Paranoid” to see what I mean. Because they’re single coils, P90s are prone to the same noise issues - but just like other single coils, various companies also make noiseless versions to counteract this. Hot Rails - Are you after a fatter, warmer sound but stuck with a single coil guitar? Hot Rail pickups are single coil-sized humbucking pickups, and are available in various forms from most pickup manufacturers! Hybrid Pickups - Some more specialist pickups use more than one type of coil, pole or material in their design, allowing you to attain unique sounds and an unusual look too! See the Reverend Reeves Gabrels Signature for a killer example! Custom Pickups - Many manufacturers offer made-to-order pickups, handwound and with materials of your choosing. This often means extra attention to detail and unique tone that you can truly call your own. Please contact us for info on custom pickups! Sustainers - Companies like Fernandes provide pickups that use a different combination of strong magnets and high output to create an infinite sustain effect. Ed O'Brien of Radiohead has a sustainer-type pickup fitted to his signature Strat - it has to be heard to believed! A passive pickup is the most common kind (to the point where people rarely even use the term ‘passive pickup’ unless they’re comparing it to an active pickup: they simply say ‘pickup’). An active pickup is usually wound much weaker than a passive pickup, but its signal is amplified from within the pickup itself, often via an internal 9V battery. There are several advantages: the output is usually more powerful, with greater sustain, tonal consistency and strength of signal regardless of cable/chain length. Active pickups are available in humbucker and single coil versions, and they’re both very quiet. Companies like EMG and Seymour Duncan offer a wealth of active humbucker options that are great for heavier styes of music, notably brandished by some of the biggest names in modern rock and metal. It’s generally very difficult to install active and passive pickups in the same guitar, so usually you’ll find one kind or the other, not both. How they work: Built like a ‘regular’ pickup but additional electronics (powered by a battery) are used to enhance the sound before it leaves the guitar. How they sound: Very low noise; crisp; full; sustaining; ‘hi-fi’; sometimes compressed/squished. The extra power means the sound will sound good no matter how long your cable is. Why you’d want them: For playing in environments that might otherwise cause a lot of interference and noise; for when you’re using a very long cable; or because you like the tone. Especially great for very clean or very distorted sounds. How they work: All onboard sound-shaping is handled by parts that don’t require additional power. How they sound: Organic, smooth, natural, ‘vintage.’ The sound will grow darker and more muffled when you use (very) long cables. Why you’d want them: If you want a more natural, organic sound. Less processed, plenty of dynamics, responsive to your playing style regardless of what it is! Whether you choose single coil or humbucker, active or passive, the size, type and configuration of magnet/s that you use in your pickup all have a big influence on the sound that the pickup produces, as does the type of wire: how thick it is, how it’s insulated, how it’s wound around the bobbins, how many turns of wire. Alnico III - The 'weakest' of the magnets used in pickups because it has no cobalt. But I guess it’d be confusing to just call it ‘Alni.’ It has the lowest magnetic pull, which means the strings are less influenced by the pickup’s magnetic pull, and this makes it a popular choice for neck pickups. It’s a little more ‘confident’ in its tone compared to Alnico II, although both exhibit a similar ‘softness.’ Many players like to balance an Alnico III neck pickup against an Alnico II in the bridge. Alnico II - Associated with the original PAF humbucker, and it’s still used today in a great number of pickups. The tone is relatively soft and clear, often described as sweet, with a slight rounding off of the more brittle treble frequencies. It can sound very musical and mellifluous with a clean tone, and rather ’singing’ with overdrive. If you’re running a hotter, more distorted tone you may find that Alnico II humbuckers tend to provide excellent note separation for complex chords. Alnico V - These usually sound hotter and more ‘edgy’ than their Alnico II and III counterparts. They’re great at more aggressive tones and in situations where you need a little more ‘unity’ in your chords: notes may knit together a little more tightly when you’re chording through heavy distortion with an Alnico V pickup. It’s also a little warmer in the midrange, which makes it great for lead guitar. Alnico VIII - Possibly the least common magnet type, but many players consider it to be an undiscovered gem. It gives you the power of a ceramic magnet but with the warmth and harmonics of an Alnico V, and is a great way of preserving some of the woodiness of your guitar tone while still hitting your amp with plenty of output. Ceramic - Usually characterised as more ‘modern,’ with a tighter low end, more ‘cut’ and higher output compared to Alnico magnets. You can usually bet that a ceramic-loaded guitar will sound pretty powerful, maybe with a little more bold midrange, especially in the upper mids. Some early ceramic pickups sounded rather flat and pinched, but as pickup companies further explored the capabilities of the magnets they discovered how to really get the most out of the tone. What's A Split Coil / Coil Tap? Many players confuse ‘coil split’ and ‘coil tap,’ using the terms interchangeably, but they’re actually quite different. Coil Split - A coil split involves a humbucker pickup whose wiring lets you essentially switch one coil off, thereby turning it into a single coil. Many players like having the tonal flexibility of having single coil and humbucker tones available in the same guitar. Unless you’re buying an intentionally vintage-styled pickup, most pickups these days come with four conductor wiring as stock. That usually entails four separate wires (a ‘start’ and ‘end’ for each pickup coil), plus a ground wire. You can have your guitar wired so you can turn off one coil via a push-pull switch built into a volume control, or you can use a separate toggle switch, or (depending on the type of switch you’re using) special custom wiring. You will get single coil hum when using single coil mode, but not humbucker mode. Coil Tap - A coil tap is different: it involves a single coil pickup which is made with an extra wire coming off it to give you two different levels of output. The full output and a lower ‘tapped’ output. Again you can use a push-pull knob, a toggle switch or special wiring to engage the tapped mode. The benefit here is that you can have a ‘full-power’ sound for solos and huge riffs, then flip to tapped mode to reduce the output, distortion and volume for quieter moments when you need to drift into the background a bit. Amplifying an acoustic guitar can be tricky. Part of what makes an acoustic guitar great – perhaps the most major part, really – is the resonance that occurs within the body itself. But the most popular type of pickup for acoustic guitars is the piezo element, which lives underneath the bridge saddle and translates the vibration of the strings through the bridge into amplifiable sound. But this process gives you a distinctive harsh ‘quack’ tone which you then need to either live with or eliminate. Acoustic guitars often contain different types of preamps that allow you to thicken/smoothen the otherwise synthetic effect of the piezo pickup. Check out our comprehensive guide to Acoustic Guitar Pickups for more info, or click the link below to browse our selection! These brands are just a selection of what we offer at Andertons Music Co! Click here to view our full range of pickups - you're bound to find something that works for you! 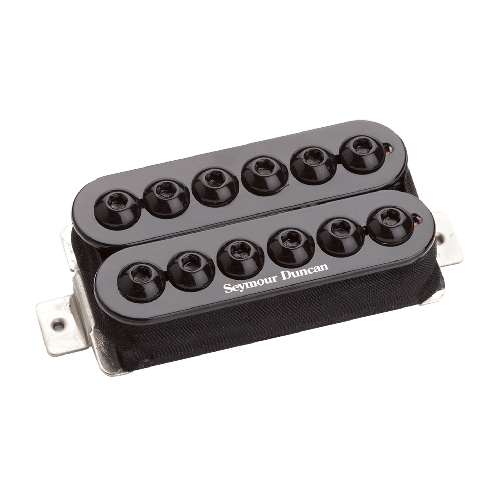 Seymour Duncan are one of the all-time biggest names in the pickup and guitar electronics category. You'll see Seymour Duncan pickups adorning countless guitars, and their vast range reflects their experience. These guys specialise in high-output passive humbuckers, but that's only scraping the surface of what they're capable of! Check out our full range here! Fishman are favoured by numerous artists from Blues & Country supremo Greg Koch to Deftones Chugmaster Stephen Carpenter. Fishman offer pickups with a specialist edge, including active 7 / 8-string pickups, and crystal-clear acoustic pickup systems. Check out our full range here! Bare Knuckle make a range of single coils, humbuckers, p90s and bass pickups. They even do humbucker sized p90s if you have an HH guitar that needs a bit more clarity. As their name might suggest, these pickups are favoured by rock and metal players for their raw edge, adding some extra organic grit to the high-output formula! Check out our full range here! DiMarzio made a name for themselves by offering one of the first after-market guitar pickups: The Super Distortion. It remains one of their most popular models, but their range is known for high output, incredible sustain and versatile applications! Check out our full range here! EMG - In the 1980s, guitarists found themselves looking for more and more gain as hard-rock and heavy metal picked up traction. EMG answered the call, pioneering active pickup systems that had a far higher output than anything else on the market. Our range includes their staple sets, such as the classic 81 & 85 Active combo, as well as a range of signature pickups from Steve Lukather, Kerry King and many more! Take a look at our full selection here! Shop All Guitar Pickups Now! How Do I Install New Pickups? For some, even simple guitar maintenance can be daunting! This is your precious instrument - the last thing you want to do is fiddle with it and cause problems! Installing pickups is, on paper at least, relatively straightforward. It usually involves careful removal of strings and pickguard (if you have one), un-mounting and disconnecting your current pickups, a little bit of soldering - and then going back the way you came! Servicing at Andertons Music Co.
All of this having been said, I still find the prospect slightly daunting myself at times. Luckily, we offer full servicing and repair options at Andertons Music Co! We aim to have all services turned around within 3-5 days, with a maximum 10-day turnaround at peak times. Single pickup installation starts at £50/hr + parts; our dedicated repair and QC team is incredibly experienced and flexible in what they offer. Check out our Workshop & Repairs page for more information! Pole Piece - A metal slug or screw which corresponds to each individual guitar string, focusing the pickup’s magnetic field at the optimal position to do its job. Coil - The basic structural foundation of a pickup: wire wrapped around pole pieces, either as a self-contained unit (in a single coil) or as part of a slightly more complex assembly which shares a single magnet (humbucker). Single coil - a pickup style which provides excellent clarity and translation of the sound of the string, but which is susceptible to certain kinds of background hum. Humbucker - a pickup designed to eliminate the hum of single coils by cancelling it out with an opposite coil. It has more power and a thicker, warmer sound than a single coil. 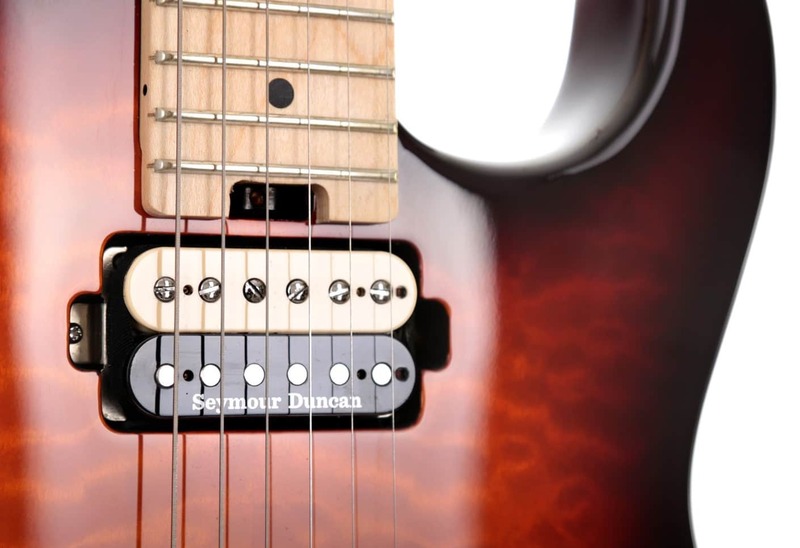 Trembucker - Seymour Duncan’s term for a pickup whose pole pieces are spaced slightly wider apart for a guitar with a Fender or Floyd Rose-style bridge. F-Spaced - DiMarzio’s term for a pickup whose pole pieces are spaced slightly wider apart for a guitar with a Fender or Floyd Rose-style bridge. Coil Split - A type of wiring option which ‘turns off’ one coil of a humbucker to approximate the sound of a single coil. Usually requires a pickup with four conductor wiring. Coil Tap - A type of wiring available with certain kinds of single coil where a ‘tap’ is run off the wire at a certain point, giving you two selectable power levels. Series - When two coils are wired so that the current from one goes through the other. This is how humbuckers are usually wired as standard, or you can wire two single coils in series for a bigger tone. Parallel - A kind of wiring where the current divides and flows through both coils. Offers more ‘jangle’ and detail to the sound. This is how Stratocaster and Telecaster pickups are typically wired, and you can wire a humbucker in parallel mode too for a thinner, more detailed sound. Out-Of-Phase/Phase-switching - When two pickups are built or wired so that they cancel out many of each others’ frequencies, resulting in a hollow, distant, fluid kind of sound. Four-Conductor Hookup Wire - Lead wire (i.e. : from the pickup to the guitar’s electronics) which gives you direct access to each of a humbuckerl’s coils, so you can perform wiring options like coil split, series/parallel and phase switching. PAF - An early version of the humbucking pickup introduced in the 1950s.